stop by and help us Celebrate! The Tradition continues now over 27 years, at the historic Athens-Boonesboro School. 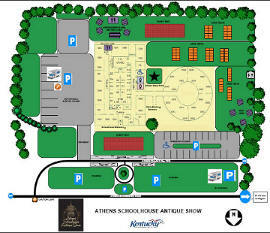 Athens Schoolhouse Antique Shows feature thousands of square feet of antiques and collectibles under one roof. Athens Schoolhouse Antiques' monthly show features the region's most discerning dealers displaying everything from American and European furniture to vintage handbags and accessories all under one roof. A beautiful historic setting, easy parking, and an expansive, organized space. We've been bringing buyers and sellers together for 27+ years. We carefully screen our vendors to ensure only the best receive coveted space in our historic schoolhouse. We offer dealers the ability to reach many prospective buyers at one show. Our shows also offer shoppers a wide variety in vendors so it is truly a win-win situation! We are conveniently located in the Heart of the Bluegrass just east of downtown Lexington, Kentucky. Our shows make a great excuse to visit the beautiful Thoroughbred countryside or take in a game at the University of Kentucky! At each of our shows you will find a high quality of antiques and collectibles as well as reputable vendors who know their antiques. You can spend the day strolling through aisle after aisle of antique furnishings, artwork, one-of a kind collectibles and much more! The Back Door Café--Eat while you Antique! The cafe is well known for offering a mouth-watering lunch menu. We are offering our popular open face pulled pork sandwich and many other assorted soups, sandwiches and homemade desserts at affordable prices. Spend the Day or the Weekend with Us! Athens-Boonesboro School is conveniently accessed off I-75 at Exit 104 (then, 1 mile East). 20 minutes from Richmond and 15 minutes from Downtown Lexington. Admission is just $2 for both days and Children under 12 are Free.